Email me at [email protected] if you want to order in some other way. On April 9.1865, Lee surrendered his army to Union forces. Confederate President Jefferson Davis fled Richmond just steps ahead of his Federal pursuers. Shortly after in the tiny town of Washington, Georgia in the drafty old State Bank Building, on May 5th, Jefferson Davis convened the last meeting of the Confederate Cabinet. He then officially dissolved the Confederate States of America. Almost a century later, Sir Winston Churchill made a very apt comment, "A nation that forgets its past is doomed to repeat it." On this, the one hundred and fortieth anniversary of Appomatox Courthouse, I am announcing a new imprint at Global Authors Publications, Flaming Magnolia Press. Books bearing this imprint will recall the heritage and strive to eliminate the hatred by telling the story of that conflict from the Southern perspective from the point of view of those who lived it. From slaves to soldiers, from generals to housewives, These books will entertain and enlighten with tales from America’s darkest hour. While most war history is taught about battles and generals, let’s not forget, "War is hell on the home front, too." Nowhere was that home front more agonizing than the Confederate States of America during the years from 1861 to 1865. Wives, daughters and sisters waited anxiously for news from the front. As each letter arrived, these women anticipated possible news of loss of a loved one. Waiting was only one torture to be endured. These previously sheltered southern ladies were often forced to flee their homes and seek shelter wherever they could find it. From one day to the next they did not know what lay in store. Yet they coped! More than coped, they triumphed. 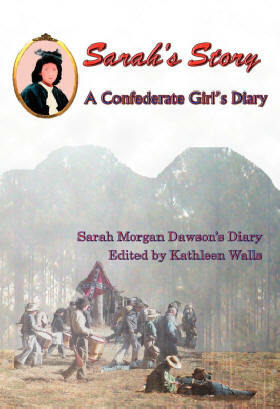 The diaries and journals women like Sarah kept tell their portion of history. These books recount terrors and trivia that made up their lives during the conflict. Always the backdrop for these everyday events was the might drama of The War. Whether you refer to it as the Civil War, the War Between the States or even the War of Northern Aggression, you will find more than a dry history lesson here. These little known works, many unpublished or retired over a century ago, tell stories you won’t want to miss. It is for this reason, the first book released by Flaming Magnolia Imprint of Global Authors Publications is Sarah’s Story. Sarah and countless other Southern women like her, lend a poignancy to history that cannot be matched by the loud clashes of generals and their armies. Day before yesterday, just about this time of evening, as I came home from the graveyard, Jimmy unexpectedly came in. Ever since the 12th of February he has been waiting on the Yankees’ pleasure, in the Mississippi, at all places below Columbus, and having been under fire for thirteen days at Tiptonville, Island No. 10 having surrendered Monday night; and Commodore Hollins thinking it high time to take possession of the ironclad ram at New Orleans, and give them a small party below the forts, he carried off his little aide from the McRae Tuesday morning, and left him here Thursday evening, to our infinite delight, for we felt as though we would never again see our dear little Jimmy. He has grown so tall, and stout, that it is really astonishing, considering the short time he has been away. . . .
To our great distress, he jumped up from dinner, and declared he must go to the city on the very next boat. Commodore Hollins would need him, he must be at his post, etc., and in twenty minutes he was off, the rascal, before we could believe he had been here at all. There is something in his eye that reminds me of Harry, and tells me, that, like Hal, he will die young. And these days that are going by remind me of Hal, too. I am walking in our footsteps of last year. The eighth was the day we gave him a party, on his return home. I see him so distinctly standing near the pier table, talking to Mr. Sparks, whom he had met only that morning, and who, three weeks after, had Harry’s blood upon his hands. He is a murderer now, without aim or object in life, as before; with only one desire - to die - and death still flees from him, and he Dares not rid himself of life. All those dancing there that night have undergone trial and affliction since. Father is dead, and Harry. Mr. Trezevant lies at Corinth with his skull fractured by a bullet; every young man there has been in at least one battle since, and every woman has cried over her son, brother, or sweetheart, going away to the wars, or lying sick and wounded. And yet we danced that night, and never thought of bloodshed! The week before Louisiana seceded, Jack Wheat stayed with us, and we all liked him so much, and he thought so much of us; - and last week - a week ago to-day - he was killed on the battlefield of Shiloh. April 16th. Among the many who visited us, in the beginning of 1861, there was Mr. Bradford. I took a dislike to him the first time I ever saw him, and, being accustomed to say just what I pleased to all the other gentlemen, tried it with him. It was at dinner, and for a long while I had the advantage, and though father would sometimes look grave, Gibbes, and all at my end of the table, would scream with laughter. At last Mr. Bradford commenced to retaliate, and my dislike changed into respect for a man who could make an excellent repartee with perfect good-breeding; and after dinner, when the others took their leave, and he asked permission to remain, during his visit, which lasted until ten o’clock, he had gone over such a variety of subjects, conversing so well upon all, that Miriam and I were so interested that we forgot to have the gas lit!